A preventive program is a cooperative effort by the patient, Dr. Trujillo and her dental team to preserve the natural dentition and supporting structures by preventing the onset, progress, and recurrence of dental diseases and conditions. Preventing dental disease starts at home with good oral hygiene and a balanced diet. It is continued in your dental office by the efforts of Dr. Trujillo and her team to promote, restore, and maintain your oral health. Prevention helps avoid serious and costly dental problems down the road/in the future and is the KEY to having a healthy, confident, beautiful smile. Digital radiography (digital x-ray) is the latest technology used to take dental x-rays. This technique uses an electronic sensor (instead of x-ray film) that captures and stores the digital image on a computer. This image can be instantly viewed and enlarged helping the dentist and dental hygienist detect problems easier. Digital x-rays reduce radiation by 80-90% compared to the already low exposure of traditional dental x-rays. Dental x-rays are essential, preventative, diagnostic tools that provide valuable information not visible to the naked eye. Dr. Trujillo and her Hygiene team use this information to safely and accurately detect hidden dental abnormalities and complete an accurate treatment plan. Without x-rays, problem areas may go undetected and may lead to more costly treatment over time. We are all exposed to natural radiation in our environment. Digital x-rays produce a significantly lower level of radiation compared to traditional dental x-rays. Not only are digital x-rays better for the health and safety of the patient, they are also faster and more comfortable to take, which reduces your time in the dental office. Also, since the digital image is captured electronically, there is no need to develop the x-rays, thus eliminating the disposal of harmful waste and chemicals into the environment. A full mouth series of dental x-rays is recommended for new patients. A full series is usually good for three to five years. Bite-wing x-rays (x-rays of top and bottom teeth biting together) are taken at re-care (maintenance) visits and are recommended once or twice a year to detect new dental problems. Topical fluoride strengthens the teeth once they have erupted by seeping into the outer surface of the tooth enamel, making the teeth more resistant to decay. We gain topical fluoride by using fluoride containing dental products such as toothpaste, mouth rinses, and gels. Dr. Trujillo & her Hygiene team generally recommend children have a professional application of fluoride twice a year during dental re-care visits. Systemic fluoride strengthens the teeth that have erupted as well as those that are developing under the gums. We gain systemic fluoride from most foods and our community water supplies. It is also available as a supplement in drop or gel form and can be prescribed by Dr. Trujillo or your physician. Generally, fluoride drops are recommended for infants, and tablets are best suited for children up through the teen years. It is very important to monitor the amounts of fluoride a child ingests. If too much fluoride is consumed while the teeth are developing, a condition called fluorosis (white spots on the teeth) may result. visit Dr. Trujillo on a regular basis. According to research conducted by the American Cancer Society, more than 30,000 cases of oral cancer are diagnosed each year. More than 7,000 of these cases result in the death of the patient. The good news is oral cancer can easily be diagnosed with an annual oral cancer exam, and effectively treated when caught in its earliest stages. It is important to note that around 75 percent of oral cancers are linked with modifiable behaviors such as smoking, tobacco use and excessive alcohol consumption. Dr. Trujillo can provide literature and education on making lifestyle changes and smoking cessation. When oral cancer is diagnosed in its earliest stages, treatment is generally very effective. Any noticeable abnormalities in the tongue, gums, mouth or surrounding area should be evaluated by a health professional as quickly as possible. During the oral cancer exam, Dr. Trujillo & her team will be evaluating the maxillofacial and oral regions carefully for signs of pathologic changes. 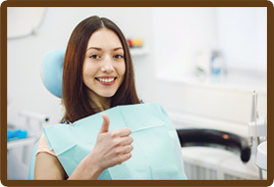 The oral cancer examination is done once per year during your re-care appointment and is a painless process. During the visual part of the examination, Dr. Trujillo will look for abnormality and feel the face, glands and neck for anything out of the ordinary. If you have any questions or concerns about oral cancer, don’t hesitate to ask Dr. Trujillo & her team. Regular dental check ups are essential for maintaining excellent oral hygiene and diagnosing potential problems, but they are not a “fix-all” solution. Thorough oral homecare routines should be practiced on a daily basis to avoid dental problems. Periodontal disease (also called gum disease and periodontitis) is the leading cause of tooth loss in the developed world, and is completely preventable in the vast majority of cases. Professional cleanings twice a year combined with daily thorough homecare can remove a high percentage of disease-causing bacteria and plaque. There are numerous types of oral hygiene aids on the supermarket shelves, and it can be difficult to determine which will provide the best benefit to your oral health. Dental floss is the most common interdental and subgingival (below the gum) cleaner and comes in a variety of types and flavors. The floss itself can help remove food particles and plaque from between the teeth. Vigorous flossing with a floss holder can cause soft tissue damage and bleeding, so great care should be taken. Floss should normally be used twice daily. We recommend woven floss to assist with plque removal. The technique used when flossing plays a big role in in its effectiveness. We are happy to show you this technique! There are two basic types of mouth rinse available: Cosmetic rinses which are sold over the counter and temporarily suppress bad breath, and therapeutic rinses which may or may not require a prescription. Therapeutic rinses, are regulated by the FDA and contain active ingredients that can help reduce bad breath, plaque, and cavities, whereas cosmetic rinses do not. Mouth rinses should generally be used after brushing. Tongue cleaners are special devices designed to remove the buildup of bacteria, fungi and food debris from the tongue surface. [The fungi and bacteria that colonize on the tongue have been related to halitosis (bad breath) and a great many systemic diseases like diabetes, heart disease, respiratory disease and stroke.] Tongue cleaners can be made from metal, wood or plastic and shaped in accordance with the contours of the tongue. There are many toothbrush types available. Electric toothbrushes are generally recommended by dentists because studies have shown electric brushes are much more effective than manual brushes. The vibrating or rotary motion helps to dislodge plaque and remove food particles from around the gums and teeth. The same results can be obtained using a manual brush, but more effort is needed to do so. Manual toothbrushes & electric toothbrush heads should be replaced every three (3) months because worn bristles become ineffective over time. Soft bristle toothbrushes are far less damaging to gum tissue than medium and hard bristle varieties. In addition, an appropriate sized ADA approved toothbrush should be chosen to allow proper cleaning to all the teeth. Teeth should ideally be brushed after each meal, or minimally twice each day. 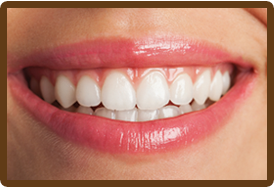 If you have any questions about oral hygiene aids, please ask Dr. Trujillo & her team. 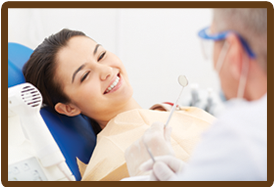 Panoramic X-rays (also known as Panorex® or orthopantomograms) are wraparound x-rays of the face and teeth. They offer a view that would otherwise be invisible to the naked eye. X-rays in general, expose hidden structures, such as wisdom teeth, reveal preliminary signs of cavities, and also show fractures and bone loss. Panoramic X-rays are extraoral and simple to perform. A panoramic x-ray is not conducted to give a detailed view of each tooth, but rather to provide a better view of the sinus areas, nasal areas and mandibular nerve. Sealants are easily applied by Dr. Trujillo and her Hygiene team and the process takes only a couple of minutes per tooth. Dental radiographs (x-rays) are essential, preventative, diagnostic tools that provide valuable information not visible during a regular dental exam. Dr. Trujillo & her Hygiene team use this information to safely and accurately detect hidden dental abnormalities and complete an accurate treatment plan. Without x-rays, problem areas may go undetected. Dental x-rays produce a low level of radiation and are considered safe. Dr. Trujillo and her team take necessary precautions to limit the patient’s exposure to radiation when taking dental x-rays. In our office, precautions include using lead apron shields to protect the body and using modern, digital sensors that cut down the exposure time of each x-ray. The need for dental x-rays depends on each patient’s individual dental health needs. Dr. Trujillo & her Hygiene team will recommend necessary x-rays based on the review of your medical and dental history, dental exam, signs and symptoms, age consideration, and risk for disease. Rinsing – It is important to rinse your mouth with water after brushing, and also after meals if you are unable to brush. All play a role in good dental home care. If you have any questions about the correct way to brush or floss, please ask Dr. Trujillo & her team.